Dr. Levine is the Chief of Gastrointestinal Radiology, Department of Radiology, Hospital of the University of Pennsylvania, and a Professor of Radiology and an Advisory Dean, University of Pennsylvania School of Medicine, Philadelphia, PA. He is also on the editorial board of this journal. Achalasia and diffuse esophageal spasm (DES) are two of the more well-known esophageal motility disorders diagnosed on barium studies and manometry. 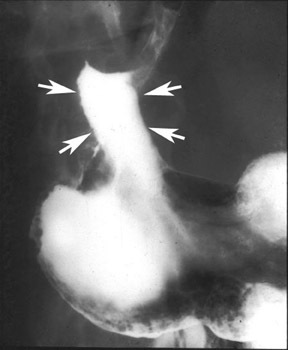 Classically, achalasia is characterized by incomplete relaxation of the lower esophageal sphincter (LES) with absent peristalsis in the body of the esophagus, 1-3 whereas DES is characterized by normal relaxation of the LES with periods of normal peristalsis interspersed with periods of weakened or absent peristalsis and abnormal simultaneous contractions. 4-6 However, some patients with achalasia have complete relaxation of the LES, whereas others with DES have incomplete relaxation of the LES, so it is important to be aware of the various permutations of these esophageal motility disorders. In patients with achalasia, it is also important to differentiate the primary or idiopathic form of the disease from a secondary form caused by a malignant tumor involving the gastroesophageal junction. The purpose of this article is to review the spectrum of clinical, radiographic, and manometric findings in patients with achalasia (including primary and secondary achalasia) and DES and to discuss the relative roles of barium studies and manometry in diagnosing these esophageal motility disorders. Primary achalasia is an idiopathic condition in which there is loss of the ganglion cells in the myenteric plexuses of the esophagus. 7,8 This motility disorder leads to the absence of peristalsis in the body of the esophagus and incomplete relaxation of the LES. Primary achalasia is classically characterized on manometry by absent peristalsis in the body of the esophagus and incomplete relaxation of the LES, often accompanied by elevated LES resting pressures (ie, a hypertensive LES). 1-3 However, some patients with achalasia have nonperistaltic contractions in the esophagus, and others have normal LES function on manometry. "Vigorous" achalasia, a common variant of achalasia that is characterized by simultaneous, ineffective, relatively high-amplitude contractions, has been found to account for as many as 30% of all cases of achalasia. 11,12 The degree of relaxation of the LES on manometry is not a reliable criterion for diagnosing this condition, as some patients with typical clinical and radiographic findings of achalasia are found to have complete relaxation of the LES on manometry. 13-15 Therefore, it is important to be aware of the spectrum of manometric findings in these patients. Because secondary achalasia is usually caused by malignant tumor, affected individuals tend to be older patients (>60 years of age), with recent onset of dysphagia (<6 months in duration) and substantial weight loss. 25 These clinical parameters contrast strikingly with those of primary achalasia, which tends to occur in younger people with long-standing dysphagia and little or no weight loss. 9,10 Therefore, the clinical presentation is extremely helpful in differentiating the primary and secondary forms of the disease in patients with radiographic or manometric findings of achalasia. Nevertheless, overlap in these clinical parameters has been reported. 26,27 In various studies, as many as 28% to 38% of patients with primary achalasia have been found to be >60 years of age, 26,27 so patient age is not an infallible criterion for differentiating primary from secondary achalasia. The manometric findings in secondary achalasia may be indistinguishable from those in primary achalasia. At endoscopy, however, it is more difficult to advance the endoscope into the stomach in patients with secondary achalasia than it is in those with primary achalasia because of tumor circumferentially encasing the gastroesophageal junction. 20,27,28 This observation, therefore, should increase the endoscopist's suspicion of secondary achalasia. 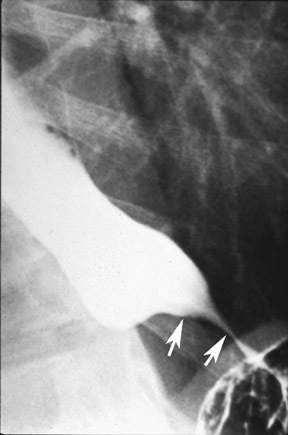 In patients with secondary achalasia, barium studies usually reveal absent primary peristalsis in the body of the esophagus with tapered, beaklike narrowing of the distal esophagus near the gastroesophageal junction, mimicking the appearance of primary achalasia (Figure 5). 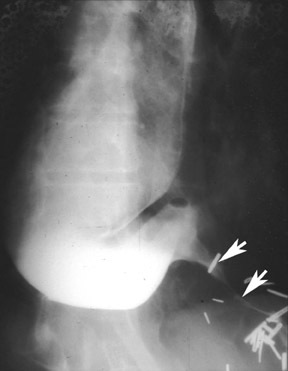 However, other radiographic findings (such as eccentricity, nodularity, angulation, straightening, or shouldering of the narrowed distal segment) should raise concern about the possibility of secondary achalasia (Figure 6). 18,21,22,29 Although these classic findings of secondary achalasia are present in only a small percentage of cases, investigators recently found that the narrowed distal esophageal segment is >3.5 cm in 80% of patients with secondary achalasia but rarely exceeds 3.5 cm in patients with primary achalasia (Figures 6 and 7). 10 Thus, the length of the narrowed segment appears to be the single best criterion for differentiating primary achalasia from secondary achalasia on barium studies. Also, the esophagus tends to be considerably more dilated in primary achalasia than in secondary achalasia, 10 presumably because of the more gradual course of the disease that allows the esophagus to progressively dilate over a period of years. When achalasia is detected on barium studies, it is extremely important to evaluate the gastric cardia and fundus to rule out malignant tumor at the gastroesophageal junction as the cause of these findings. 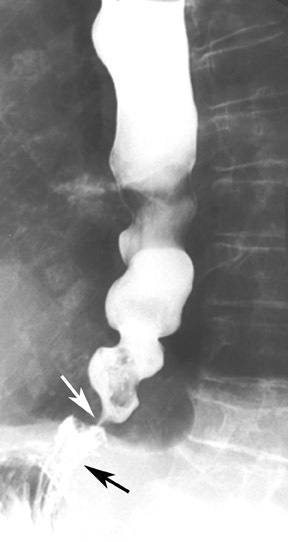 An advanced tumor at the cardia may be manifested on barium studies by a polypoid or ulcerated mass in this region or by an infiltrating or scirrhous lesion encasing the gastric fundus (Figure 5B). 18,20,29 In other patients, barium studies may reveal thickened, lobulated folds and irregular areas of nodularity or ulceration that distort or obliterate the normal cardiac rosette, 29 so optimal double-contrast technique is required to detect these lesions. 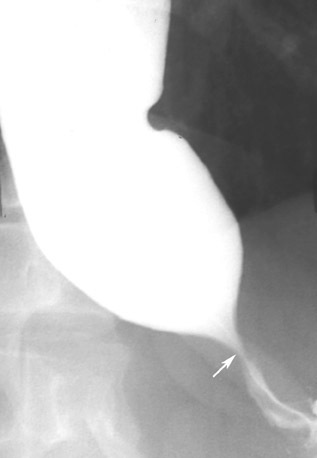 Nevertheless, the cardia and fundus cannot be adequately evaluated on radiographic studies in many patients with secondary achalasia because of delayed emptying of barium from the esophagus (so, paradoxically, the stomach empties faster than it fills with barium). 10 Radiologists, therefore, should be aware of the limitations of barium studies in evaluating the cardia and fundus in patients with suspected achalasia. Computed tomography (CT) may reveal asymmetric thickening of the distal esophageal wall, a soft tissue mass at the cardia, or mediastinal adenopathy in patients with secondary achalasia. 30 In contrast, CT typically reveals little or no esophageal wall thickening and no evidence of a mass at the cardia in patients with primary achalasia. 30-32 Therefore, CT may be extremely helpful in differentiating primary achalasia from secondary achalasia when the clinical or radiographic findings are equivocal. CT may also be helpful in identifying the site of the primary tumor or other evidence of metastatic disease in patients with secondary achalasia caused by remote neoplasms. 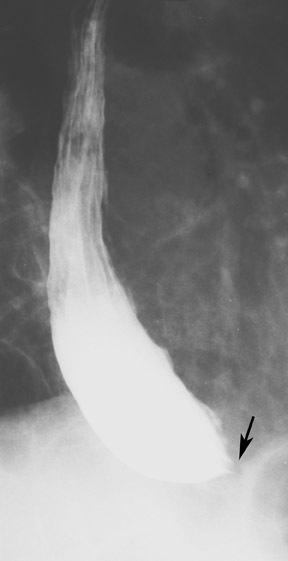 The classic description of DES on barium studies includes the presence of repetitive, simultaneous, lumen-obliterating nonperistaltic contractions that compartmentalize the esophagus, producing a distinctive "corkscrew," "rosary bead," or "shish kebab" appearance (Figure 8). 16,17,39 In a recent study, however, lumen-obliterating nonperistaltic contractions were detected on barium studies in <15% of all patients with DES. 35 Instead, most patients had nonperistaltic contractions of varying magnitude that did not obliterate the esophageal lumen (Figure 9). Thus, radiologists should recognize that the severity of nonperistaltic contractions can vary in patients with DES and that the absence of a "corkscrew esophagus" on barium studies in no way excludes this diagnosis. 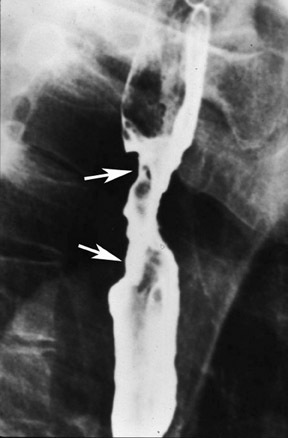 Although DES is not traditionally thought to be associated with LES dysfunction on barium studies, 17,39 recent literature suggests that the majority of patients with DES have impaired LES opening on barium studies with the tapered, beaklike distal esophageal narrowing that is typically associated with achalasia (Figure 10). 35 In a recent study, nearly two thirds of all patients with DES were found to have impaired LES opening on barium studies. 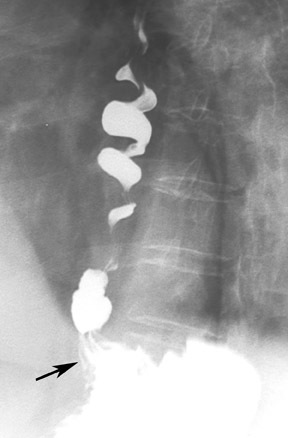 35 Thus, it should be recognized that DES is characterized radiographically by frequent LES dysfunction with nonperistaltic contractions of varying severity, rather than a classic corkscrew appearance on barium studies. Hiatal hernias appear to be more common in patients with DES and associated LES dysfunction than in those with achalasia (Figure 10). In one study, 89% of patients with DES and impaired opening of the LES had hiatal hernias on barium studies. 35 Although hiatal hernias are uncommon in patients with achalasia, another study found an increased frequency of hiatal hernias in patients with achalasia who were >50 years of age. 40 Thus, the higher frequency of hiatal hernias in patients with DES and LES dysfunction could be related to the older age of these individuals. Although there may be discordance between the findings on barium studies and manometry in the evaluation of DES, most patients with impaired opening of the LES on barium studies or incomplete relaxation of the LES on manometry who were treated with endoscopic balloon dilatation or botulinum toxin injections at the gastroesophageal junction have had a positive response to therapy. 35 These data suggest that barium studies and manometry have complementary roles in the evaluation of patients with DES. Radiologists and gastroenterologists should be aware of the radiographic and manometric features of LES dysfunction in patients with DES, so they can guide proper treatment of these individuals. Barium studies and manometry have complementary roles in the evaluation of achalasia and DES. Furthermore, these motor abnormalities should be considered opposite ends of a spectrum of related esophageal motility disorders, with many patients having combined radiographic and manometric features of achalasia and DES. Achalasia and diffuse esophageal spasm: Spectrum of findings and complementary roles of barium studies and manometry. Appl Radiol.